A 2 cylinder V engine is presented. The angle between the cylinders may be altered between the limits of 60 degrees and 180 degrees. 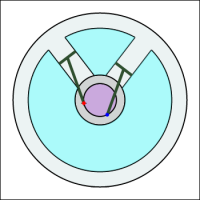 Drag the red point to turn the crank.